The Villa within Quinta Del Encanto is comprised of a variety of residential accommodations; each quite private, commanding an incredible bay and coastline view. Within the Villa residences may be combined to create a 4-bedroom, 4-bathroom, 2-kitchen hideaway. 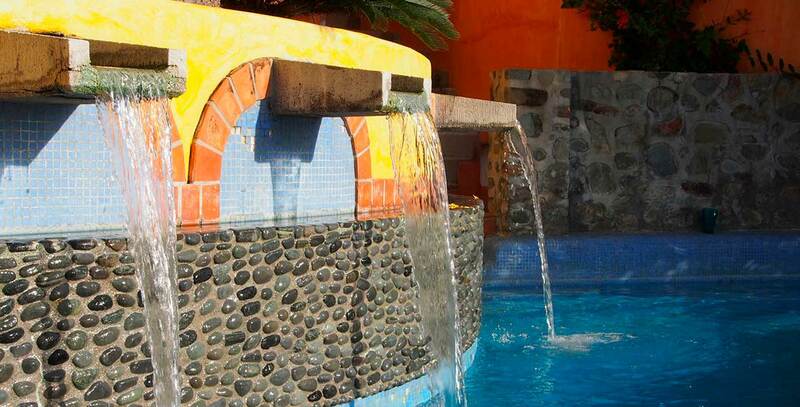 Each overlooks the Venetian-tiled pool; its fountains and flowing waters create an atmosphere not experienced by most! While sitting on the terraces of the Villa, you can see the beaches of Bucerias, the coastline of Nuevo Vallarta, the coastal resort of Puerto Vallarta, and the Bahia de Banderas. A taxi zone is available minutes away. The local beaches and village are a delightful five minute stroll. The aqua lagoons and coral-sand surfing beaches of the Bahia de Banderas coastline can be viewed on route to Punta de Mita, within 15 minutes from the Villa. The Villa is staffed with a houseman, maid, and gardener. For your convenience the maid cheerfully serves breakfast, if you desire. The Villa at Quinta Del Encanto is comprised of the accommodations below. * Min. 2 night. Inquire for Semana Santa, Christmas and New Year’s tariffs.